We had a wonderful turnout for this year’s district meeting. Our dinner was at capacity and we had guests from across the district and even some Brothers from Idaho! Thank you to all who came out to hear about what the Grand Lodge and District 24 are up to. Blue Mountain Lodge No 13 F&AM hosted the district 24 meeting this year to celebrate its sesquicentennial (150th) anniversary. The Grand Master’s Achievement Award was bestowed upon Worshipful and Illustrious Brother John Stanford. Thank you, Brother, for all of your many contributions to the craft. The news release for the event is below. 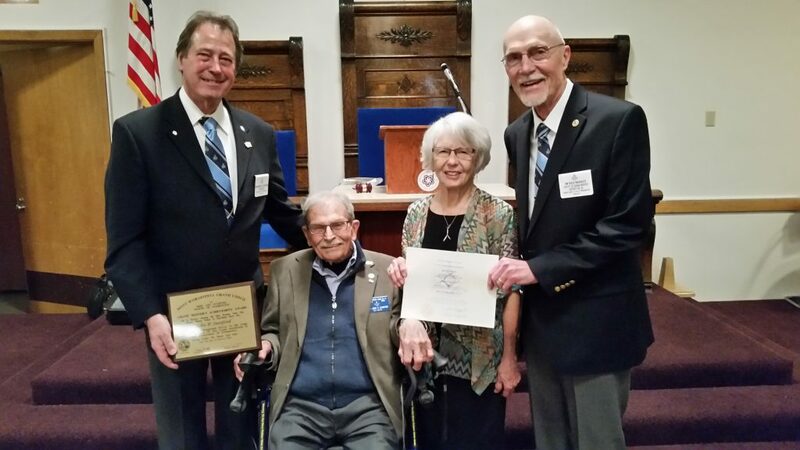 (University Place, WA, March 9, 2018) — The Free and Accepted Masons of Washington held their annual regional banquet along with a business and awards meeting this evening at an event hosted by Blue Mountain Lodge #13 in Walla Walla. During the gathering, the host Lodge announced plans for its 150th anniversary in the Walla Walla Valley. The business session featured a number of guest speakers and program executives from the statewide headquarters. Grand Master Schoeben took the floor for remarks and award presentations after the other agenda items were completed. He highlighted the theme for his term, “Communicate to Educate,” and discussed the many charitable works of the organization around the state to aid and assist people with unique needs, provide scholarships, support civility, programs and opportunities for youth, work with military and veteran families, and encourage reading programs in public schools. He also took time to present high honors to a longtime Masonic Brother from College Place, assisted by District Deputy Warnock. 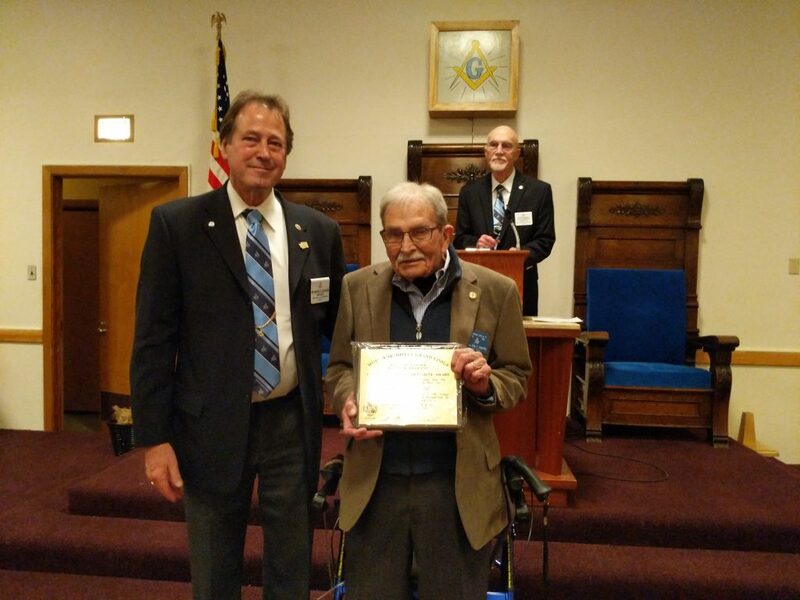 The Grand Master then called on Largent to assist him in also presenting Stanford with another Masonic honor, the “Hiram Award” for outstanding service to his Lodge and its members. Stanford notes that he was the Worshipful Master of Blue Mountain 13 “around 1989” and has seen many changes over the years, but has always been pleased with its progress. The 92-year-old Brother is also a 33rd Degree Scottish Rite Mason and a Noble of the El Katif Shrine and past president of the Blue Mountain Shrine Club. Stanford graduated high school in Hope, Arkansas and then joined the U.S. Army Air Corps with the 380th Bomb Group, flying combat missions as a B-24 “Liberator” ball turret gunner out of Papua, New Guinea. He rose to the rank of technical sergeant before being discharged after World War Two. He returned home to attend the University of Arkansas and earned a law degree. He later joined the federal civilian workforce, and after a career at locations around the country, retired as the Chief Counsel for the Walla Walla District of the U.S. Army Corps of Engineers.